Welcome to the 101st post at A Joyful Cottage, and to the April edition of Every Room In The House -- the month-long blog party where we link up to a theme room of the month. This party is intended to inspire all of us who love to feather our nests -- one room at a time, and provide a place where inspiration is categorized by room. How easy is that when you want to find ideas specific to a particular room in your home now, or in the future. This month we're partying in The Bathroom. 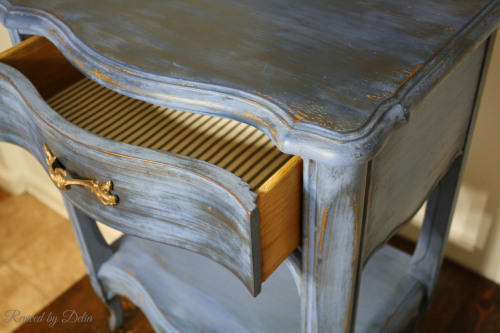 Shabby Chic Meets French Country by Anne at Design Dreams by Anne. You absolutely must see Anne's bedroom transformation if you haven't yet done so. 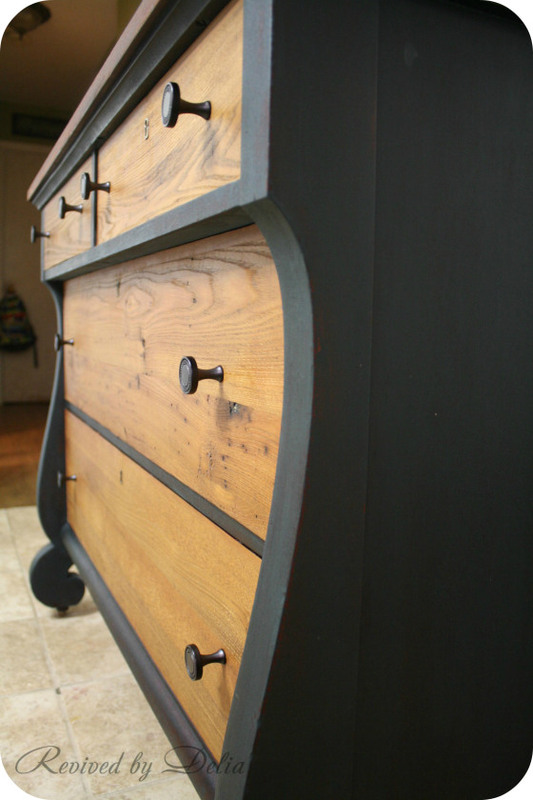 Her post is jam packed with DIY projects that will fire up your own DIY mojo. 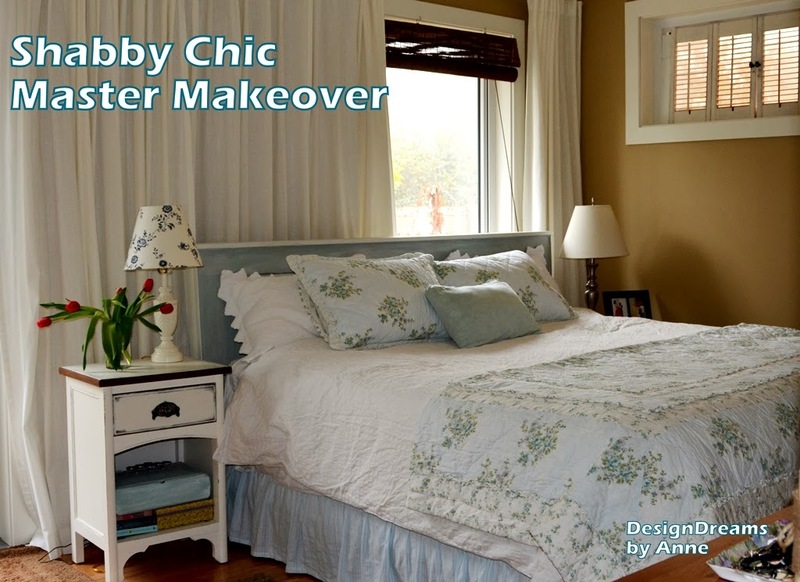 Freshening Up the Master Bedroom by Mary Alice at Chateau Chic. Her French inspired bedroom is fabulous. Mary Alice has a great eye for creating vignettes in her home, and her dreamy bedroom is no exception. Arch Window Find by Terry at Forever Decorating. Terry shows us how the addition of one great architectural feature can add instant room impact. And I love how she shows us the different looks she creates just by switching out what she hangs on the arch. Wonderful inspiration, but let's not stop here. There's more. 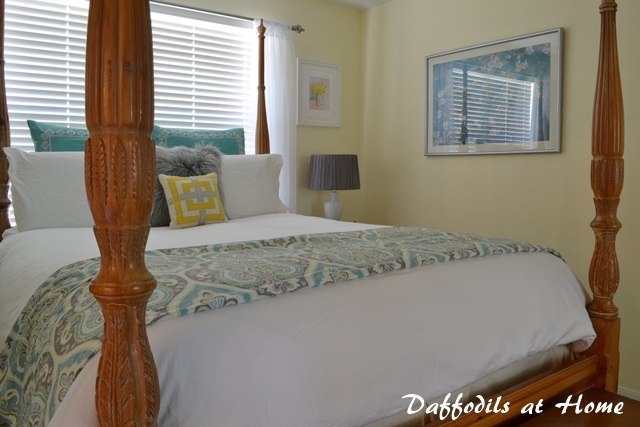 . .
Lisa at Texas Décor gave us a tour of her Master Bedroom Makeover. What a difference between her "before" and "after" photos. I absolutely love how she hid the technology in her bedroom to give the room an uncluttered, beautifully tailored and traditional look. 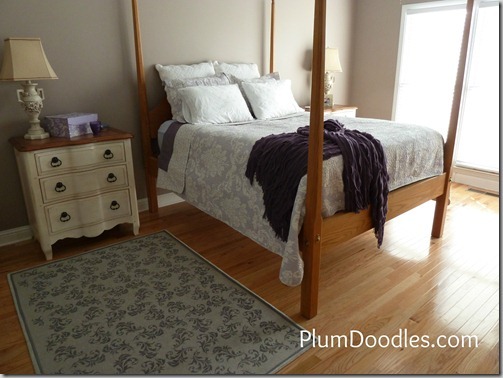 Sheila's Master Bedroom Tour at Plum Doodles has me wondering why I've never painted my bedroom ceiling blue. Her Behr Cumberland Fog ceiling with the Silver Pebbles wall color is gorgeous. The four poster bed is scrumptious, and that stenciled rug? Well, I'll tell you more about that in a minute. Need a dose of spring inspiration? 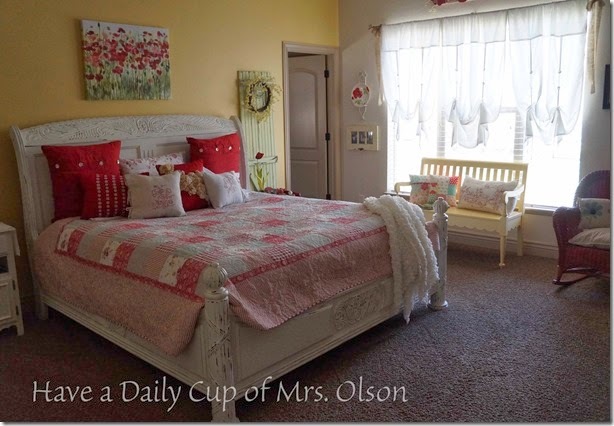 Jann at Have A Daily Cup of Mrs. Olson gives us plenty of that with Adding Spring to the Bedroom. Jann effectively uses a mix of color and patterns to pull her bedroom together and give it her own personal touch. Love her style. Nancy at Daffodils at Home does some "stylin' in the bedroom." She shares Slowly Discovering My Style and how it translates to a lighter, brighter, prettier master bedroom. I like how Nancy demonstrates how to shop our own homes, as well as use a little spray paint on existing items, to give a room a fresh, updated look. 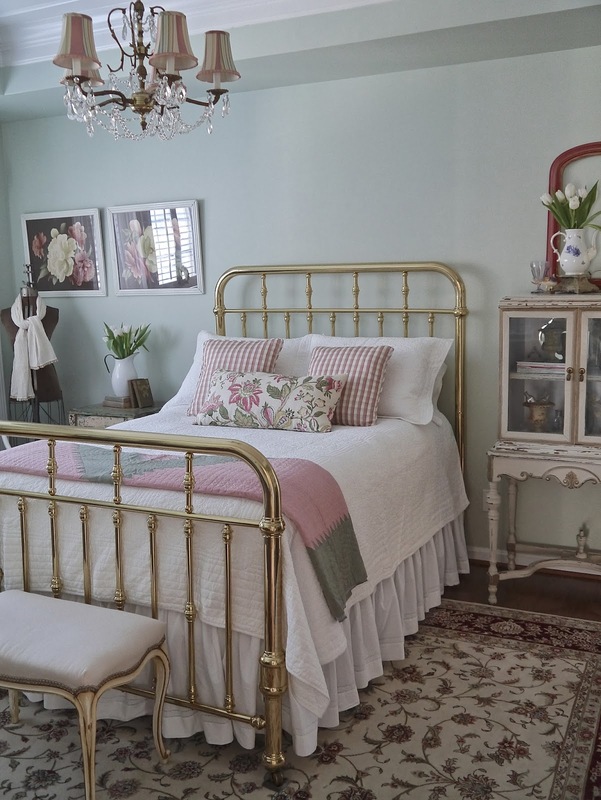 JoAnne at A Pocketful of Blue gives us a look at her master bedroom with Master Bedroom Restyle. It all started with new lamps. Can you relate? You'll enjoy seeing how JoAnne's pretty new lamps led to a charming cottage bedroom. Sometimes all it takes to make a master bedroom shine is to change out an accessory or two. 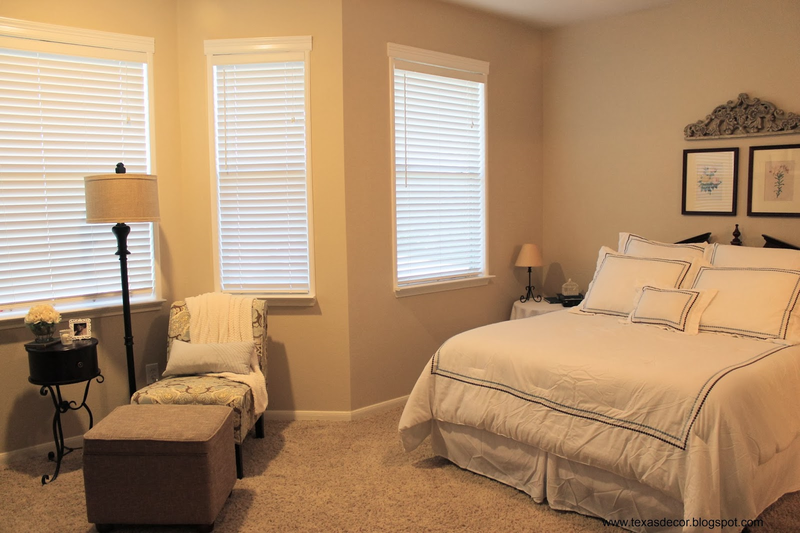 Kim at Exquisitely Unremarkable does just that with her Master Bedroom Update. 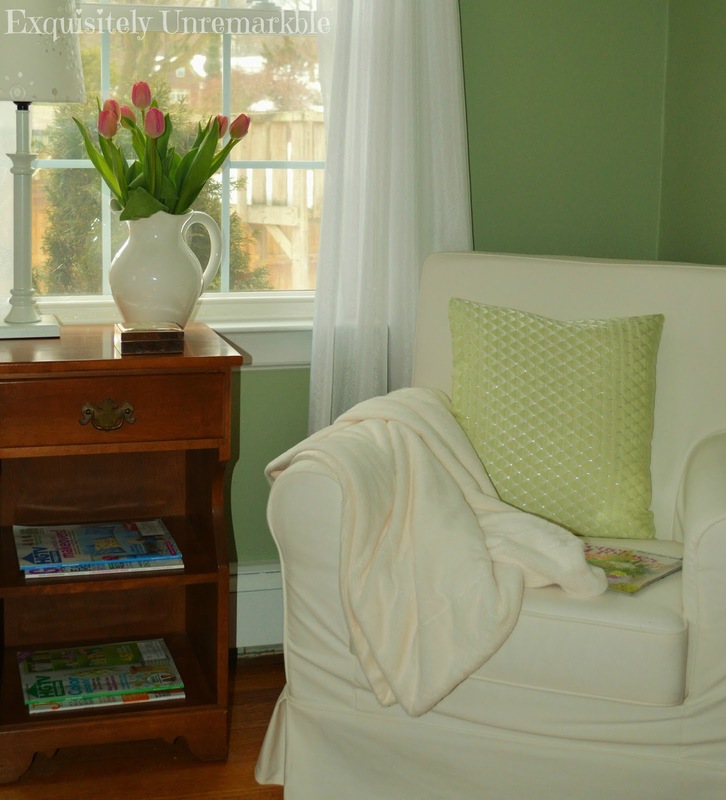 See how she created a welcoming reading nook with a pop of color. I'm ready to cozy up in that pretty spot. 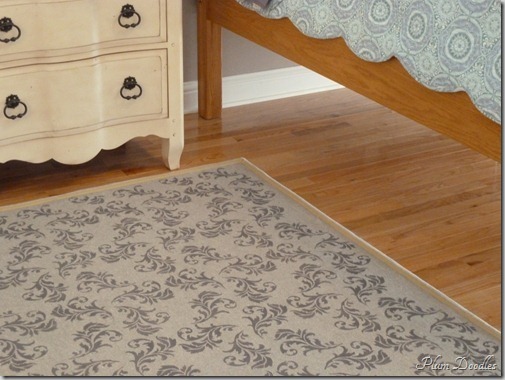 Remember I promised to tell you more about Sheila's stenciled rug? She took an existing rug, flipped it over and did her own stenciling on the back side. All I can say is "wow". Sheila shows how it 's done at Stencil an Area Rug. Who doesn't love beautiful hardwood floors? 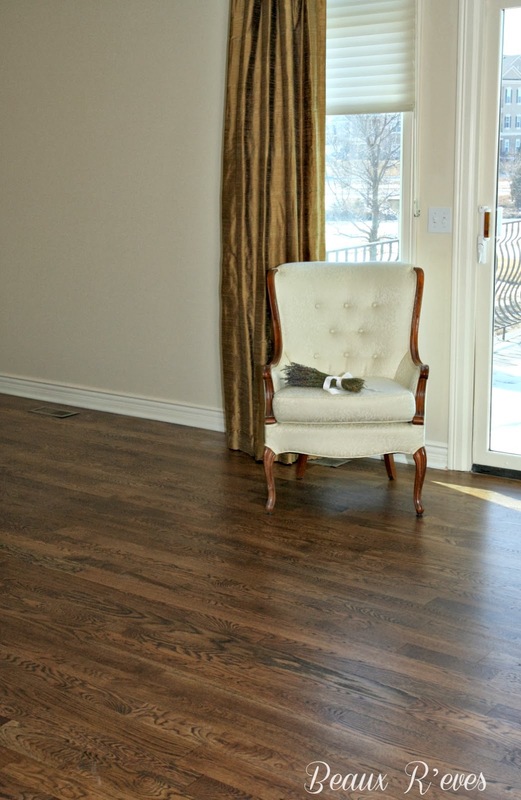 Cindy of Beau R'eves is the happy owner of a new hardwood floor in her master bedroom and we get to share in her excitement at Hardwood Floors in the Master Bedroom - Step by Step. And that beautiful chair? Ooh La La. Have you ever wanted to learn how to rewire a lamp? Well, here's your chance to see how it's done. 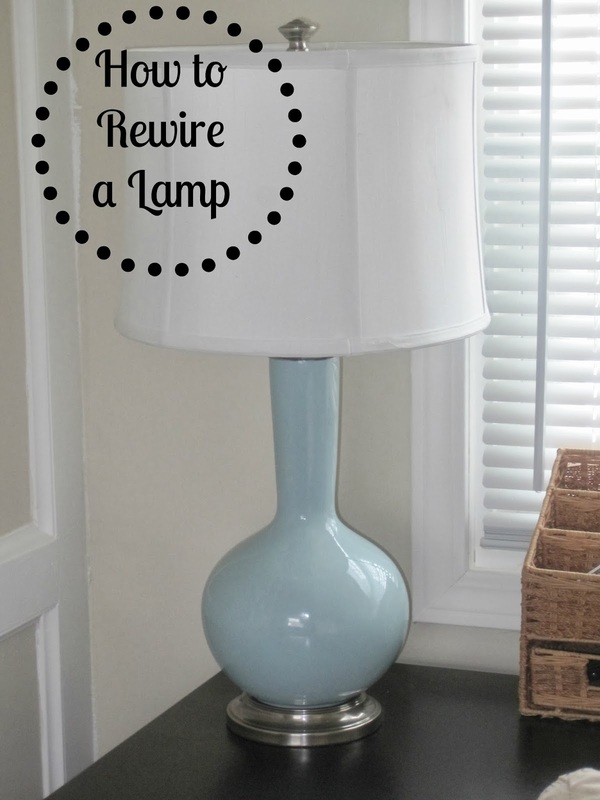 Jennifer at Decorated Chaos shares her tutorial at How to Rewire a Lamp. I love the fact that she didn't let an inoperable lamp stop her from taking advantage of a great thrift store find. This lamp rocks. Gina at Old World Patina does wonderful patina work. 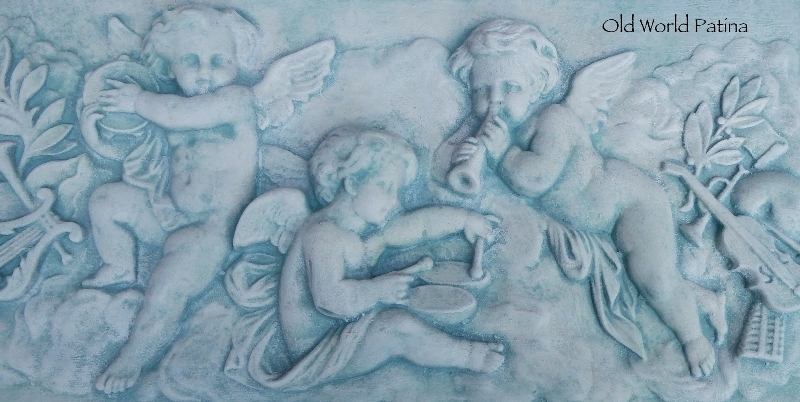 She shares her Plaster Angels in Blue, which hangs in her bedroom. Don't miss this exquisite piece. I'm crazy about it. 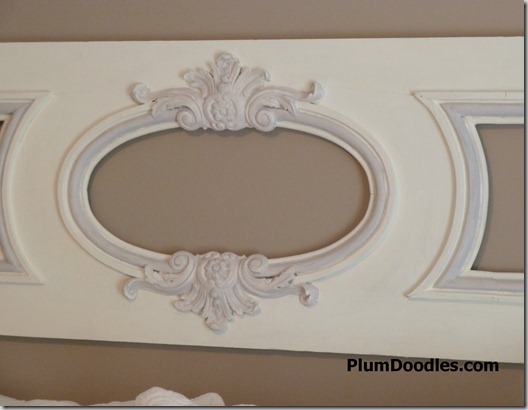 I'm so glad Sheila at Plum Doodles shared another master bedroom post: Painted Wood Wall Hanging. This way you get to see what a stunning addition this makes to her updated bedroom. Her decision to hang it above her bed is brilliant. There's something about furniture redos that fulfills my need to see Ugly Ducklings become Beautiful Swans. I'm happy to show you some of the best I've seen. 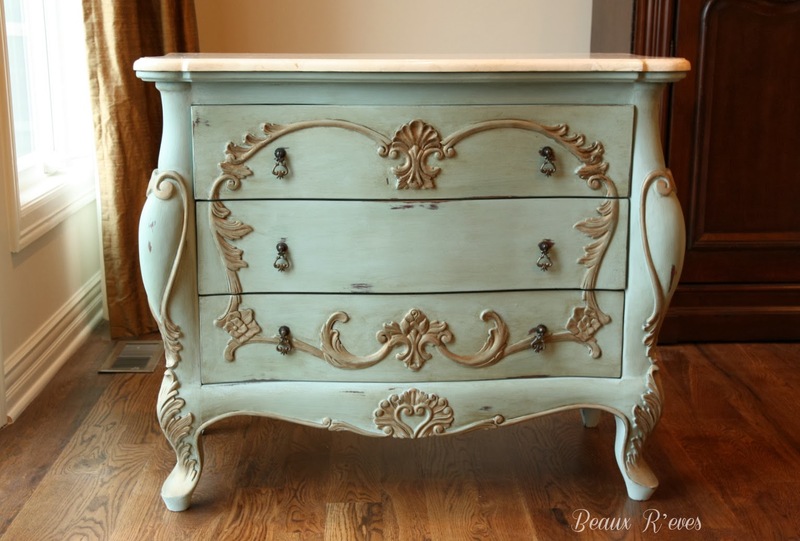 Or maybe I'll "borrow" this extraordinary Country French Painted Chest that Cindy at Beau R'eves shared. That is if I can recover from swooning over it. Wait until you see the "before" photo. You know those outdated and rather tacky men's valet stands found at yard sales and thrift stores? You do? Well, after you see what Cindy at Confessions of a Serial DIYer did with one she brought home you'll probably have a whole new view of those things. I love her vision in Men's Valet Stand Becomes a Pretty Stool For Her. 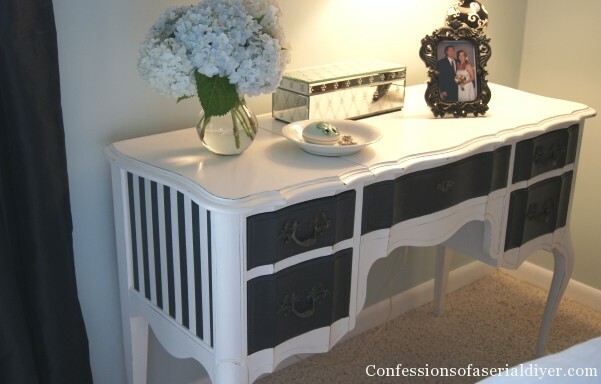 Cindy shows us another of her fabulous pieces with Dressing Table Makeover. I love how she painted it, and can't imagine finding something like this for the price she paid. How much? Sorry, you'll have to see for yourself. Who's that napping in the master bedroom of Julie at Love My Simple Home? Why it's her sweet kitty. See more of her adorable feline at Cat Napping. 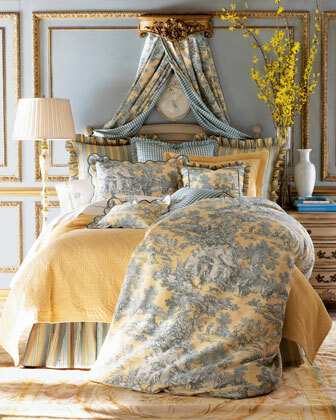 Finally, if you're in the mood for master bedrooms featuring toile, then my post Girl Meets Toile de Jouy - 16 Master Bedrooms Featuring Toile may be just the thing. Thanks to each and every one of you who shared in the March party. I want to mention that the page viewing continues far beyond the end of the link up and my stats show that each month the numbers grow. So, hopefully you're getting and will continue to get views on your blog from ERITH. And now let's start the April party. Right now there's no limit to the number of posts you may link up, and they don't have to be recent posts. But they do have to be about your bathroom(s). Room reveals, decorating, DIY, remodels, furniture redos, thrift finds, organization -- whatever relates to your bathroom, we want to see it. The party will be open all month. 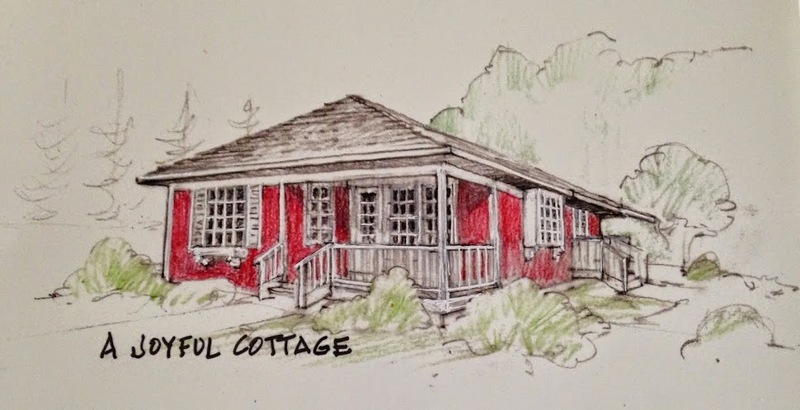 Oh, and please, please remember to put a link in your post back to A Joyful Cottage. Mucho necessary to be featured. Love all the beautiful bedrooms. Makes me what to paint mine another color, but that will wake a couple of more years since I just did it a few years ago. I would show my bathroom, but it is on the to do list for remodel next year and it looks horrible. Such lovely cottage like bedrooms . . . I like seeing and visiting just for the ideas! Lovely bedrooms!! Thank you for featuring mine - happy April 1st!!! Thank you for featuring my sweet kitty taking his nap in our bed. All of the bedrooms featured are amazing. Thanks for featuring my reading nook, Nancy! Now if I could just get in there and find the time to read! ;) Happy April! Let's party! Thanks so much for featuring my bedroom, Nancy! I really appreciate it! All the features look beautiful and I plan on checking them all out. :) Enjoy your day! Thank you for featuring my angel plaque! I am honored to be among such beautiful home decor...and the kitty! 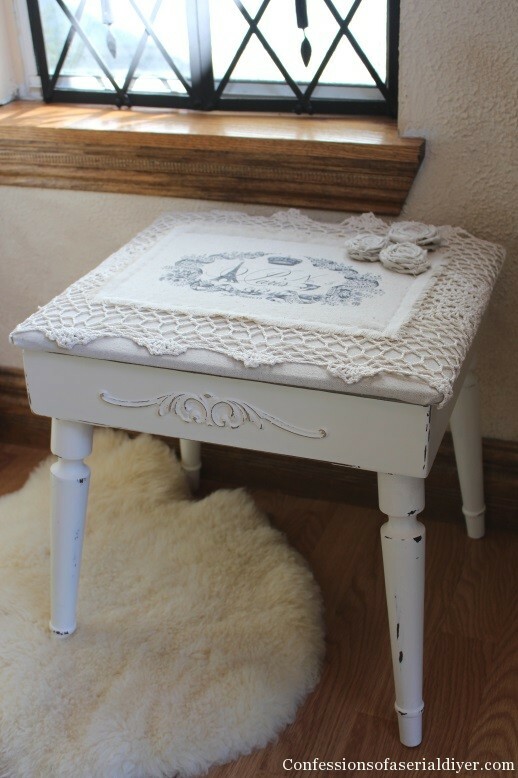 Thanks so much Nancy for featuring my Neoclassical Side Table this month! Gorgeous features in here this month - so many talented bloggers out there! Thanks for hosting the party again this month. I really appreciate my master bedroom being included in all the wonderful features!! Hi Nancy, always love all of the wonderful inspiration here. so many fabulous bedrooms and décor ideas! Thanks so very much for including mine amongst these great features. I'm off to a church dinner. Have to go early and help decorate. I will be back to link up. 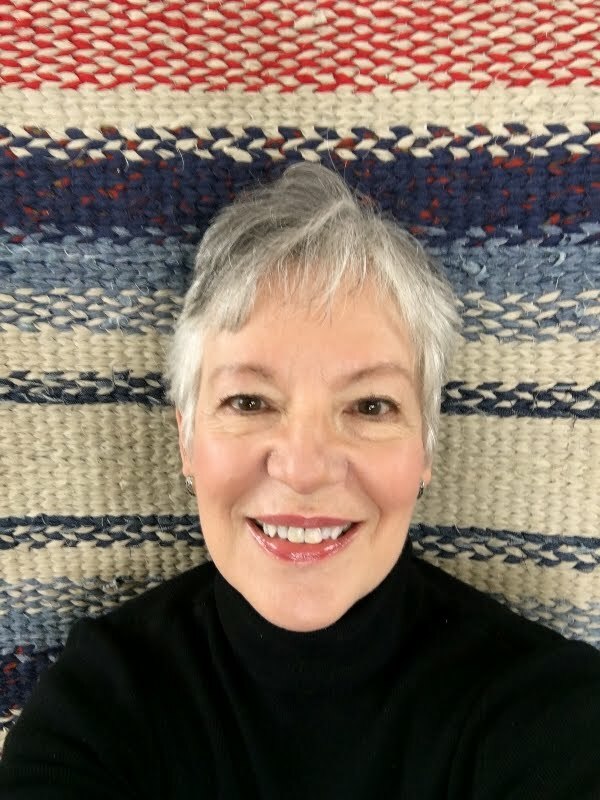 Hi Nancy...I really loved your comments on my Lakehouse blog. Thank you for stopping by. What a fun, and lovely blog you have here. I tried to link up my last post for the bathroom party, but I couldn't get the linky thing to work. I'll be back to check out more of your posts again.